Always tell Val . . . John & Ed say Hi! 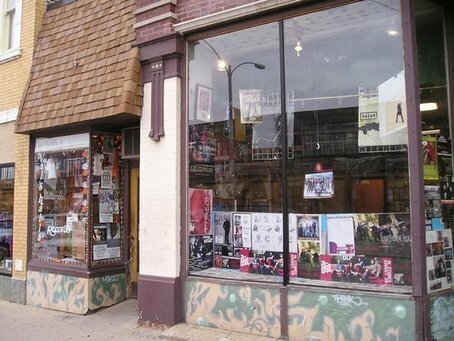 Val’s Halla Records was born July 26, 1972 following the demise of a small record chain Val Camilletti had managed from the same location since 1968. One week after the fall of the chain, Val was able to lease the empty location that had been her home for almost five years and — with the all-volunteer efforts of former employees — literally brought a myth to life. After almost four decades in their original home on South blvd, the spectre of re-development reared its head. The result was a relocation to the Arts District of Oak Park. Thousands and thousands of purchases later, the store brims over with 45s, LPs, cassettes and CDs in every conceivable musical category, from big bands to bauhaus, from rockabilly to rap. People come from all over to search her bins for that rare childhood musical memento or to explore a new musical landscape. In addition to this Val's Halla Records also has a small stage for upcoming local bands to play music, and an Elvis Shrine in the bathroom. With all of this happening in her life Val writes and produces her own music.